The Romantic Violin Concerto series reaches Belgium and the music of Joseph Jongen, a composer more celebrated for his organ music now, but who was equally admired in his day for his orchestral and chamber works. Jongen studied at the Li�ge Conservatoire where he heard the great violinist Eug�ne Ysa�e and composer-conductors Vincent d�Indy and Richard Strauss. 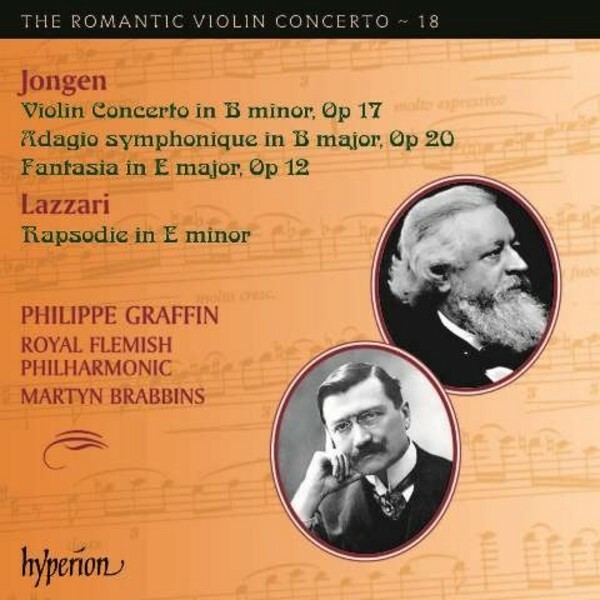 In this new album, Philippe Graffin (a welcome and familiar presence in this series) collaborates with the Royal Flemish Philharmonic and Martyn Brabbins in Jongen�s Violin Concerto, one of the composer�s first substantial works. It was described by his contemporary Florent Schmitt as �one of the finest violin concertos�, and he admired the �outpouring of warm lyricism� and �lush profusion of themes and rhythms�. Also included are other works for violin and orchestra, and a Rapsodie for the same forces by Italian Romantic Sylvio Lazzari (1857�1944) who was influenced - as was Jongen - by the music of C�sar Franck. Hyperion's 'Romantic Violin Concerto' series, like its sister series for the piano, continues to explore the unexpected byways of neglected nineteenth- and early-twentieth-century repertoires. For this latest release, conductor Martyn Brabbins and French violinist Philippe Graffin are joined by the Royal Flemish Philharmonic: an obvious choice for a disc that consists largely of music by the Belgian composer Joseph Jongen (1873�1953). Jongen's name is chiefly remembered today for his output of organ music, including the monumental Symphonie concertante (for organ and orchestra), as well as his Flute Sonata, Op. 77. Both those works date from the 1920s, but, as this disc amply demonstrates, Jongen was already an accomplished and effective composer earlier in his career. Trained as a pianist and organist, Jongen won the Belgian Prix de Rome in 1897, which provided him with the opportunity to study abroad. Among early influences were Brahms and, more importantly, Richard Strauss, evidenced by a well-developed feel for the orchestral palette. The earliest work here is the short Fantasia in E, Op. 12 (1898), starting with a brooding slow section, then picking up speed before a magical recall of the opening. The main item is the Violin Concerto in B minor, Op. 17, composed in Munich in 1900 for the violinist �mile Chaumont, but eventually dedicated to Eug�ne Ysa�e. Brimming with youthful assurance, by turns imposing and lyrical, it is a thoroughly engaging work with a fine feeling for the solo instrument, executed with tremendous aplomb and sensitivity here by Graffin. The work was greatly admired by Florent Schmitt, and it's easy to hear why, with its sure melodic touch and skilful handling of the orchestra, songlike central Adagio, and animated finale. This delightful performance will surely lead to wider recognition among violinists and audiences. Latest of the three Jongen pieces on this disc is the Adagio symphonique, Op. 20, of 1901. It's a richly-scored work, drenched in a late-Romantic soundworld, and with a high-lying but lyrical violin line floating over the orchestra. As a substantial bonus, the disc also includes the Rapsodie in E minor of 1922 by the Italian composer Sylvio Lazzari. It's an apt choice, for Lazzari � best remembered for his opera La tour de feu � was influenced by another Belgian, C�sar Franck, as well as Chausson and Wagner. It's exquisitely scored and beautifully tuneful, the violin easily riding even the more solemn passages. The performances are uniformly excellent, with an ideal balance achieved between soloist and the large orchestra, and with unerring pacing throughout. With exceptionally informative notes by Nigel Simeone, there's no excuse not to investigate this fascinating disc.